Notice: This is the most powerful machine I have ever used. I couldn't even finish my normal 15 minute workout on this machine. The machine I use has 13 mm amplitude and goes to 22 herts, just 8 shy of this one. This machine is expensive and is really only for people that want to go past 22 hertz which is the highest for the average high acceleration machine. WARNING THIS MACHINE PULLS 1500 WATTS. A 15 amp out let only puts out 1800 watts (unless someone has a 20 amp outlet). If anyone has lots of TVS or stereos or subwoofers or anything, even computers or the fan, this machine can short out. You have to put it on a dedicated outlet just for this machine. Same problem I have with infrared saunas that pull high wattage. This machine since it has a 1500 watt motor gives way more G force than 900 watt motor. With a heavier person it will make the biggest difference but with a lightweight person on the Gravity Revolution it won't make as big of a difference. If a light weight heavier person around 300 pounds is on the Nitrofit also has 13mm amplitude it will only pull a maximum of 900 watts. It doesn't slow down but the force felt is lower than a 1500 watt. Only if a person is using barbells and doing heavy weight training the 1500 watt Gravity Revolution beats it. For doing lymph drainage, the machine stays around 5 to 6 hertz and will never pull 1500 watts. My 3HP 1800 watt Vitamix blender won't even pull that much wattage unless I am making a half gallon of almond butter or blending 20 avocado pits (yes, avocados have more soluble fiber than any other food. The mother of all seeds. I go to the back of my favorite organic restaurant and I know the chef and he gives me all the avocado pits. I eat a pit every single day. (yes, I tip him so he doesn't throw them away. I do the same at the grocery store for pineapple stems. This is where vitamin companies get their enzymes from. There is more nutrients in that stem than the fruit after you shave the leaves off. I wish Whole Foods would give them to me but they throw everything away. So, the machine doesn't pull 1500 watts every time someone is on it. If a 440 pound weight (200kg) is on the machine and going at 30 hertz then yes, it can pull 1500 watts. But the power is there if people need it. Since the machine doesn't bog down even a single hertz at any weight on this it gives a constant G force that is higher than any other machine I tested. So at 6 hertz which is the speed I do my lymphatic sessions on, this machine will have more force than a 900 watt machine. This is only comparing DC motors. Not AC. The Zaaz 20K has 400 watts AC. If it's 400 watts and 3 amps, it is equivalent to 1200 watts DC. That is why the 400 watt AC motor on the Zaaz 20k is more powerful than a 1100 watt DC motor pushing a really large plate. It gets really confusing. But, this Gravity Revolution machine has so much G force it made me so sore the first few weeks, and I have been using these almost daily since 2008 when I bought my first one. I urge people if going on the high hertz (anything over 18 hertz or over) I consider high to not use this on the same body part every day. ​Warning: This machine just like the Nitrofit and Hypergravity machines on the higher levels can make most people itch. Using it on level 30 is not something people do the entire workout also. I use the Gravity Revolution on level 30 when I am doing squats or when I am sitting on it. It can be hard on the knees on those high levels. I definitely don't do pushups on it at level 30. Once the stretch reflex happens, anything over that is to me just overkill. Some people are really advanced and need this high level to stimulate that and beginners can get that reflex much earlier. People also ask if this machine is noisy. Yes, it is the most noisy machine out there. If people think the Nitrofit is noisy or the Hypergravity, this is way noisier. But most people don't really use it all the time at super high acceleration speeds so it is quiet on the low levels. I did get complaints when I turned it up high where I live. I would not recommend this if living on the 2nd floor an neighbors are under you. If using it not on the first floor I recommend a really good "non rebounding "mat. Some mats and rugs have a rebound effect. I would put it on a hard rubber mat (or mat that doesn't off gas if sensitive to smells). The mats they use at Golds gym are the ones I am taking about. The plate is just shy of 26 inches. The Vmax Pulser is 27 inches almost exact and the Zaaz 20k is about 21.5 inches. The Nitrofit deluxe plus which is the 2nd most powerful machine I have tested has around a 22 inch wide plate. At 22 hertz this is the only machine that feels stronger than the Gravity Revolution at my weight. But going up to 30 it will still beat my Nitrofit. Notice: about the noise of the machine. It comes from the skirt around the plate. The plate is moving so fast creating vibration and wind that the skirt has to make some type of noise. It is also a fiber glass resin material. Its 2cm thick. Most machines don't need that thick since they don't go to that speed. It does not have that plastic cover that cracks like the older generation high speed machines had. Holds up to 440 pounds and went down to 29.4 hertz. The Vmax Pulser 2 holds up to 440 and it does not maintain anywhere close to 30 hertz with a loaded plate that heavy. We now have limited stock of the Gravity Revolution and can ship right away. The Gravity Revolution since it goes to 30 hertz at 13 mm amplitude. This shakes up the machine more than any other I have seen, even the CV9 which was a model that came out before this one. The only thing I don't like is that the skirt makes a vibrating noise but at high acceleration levels it doesn't come without noise. It goes to 5 hertz (most machines with 13 mm amplitude go to 6 hertz but this one has so much force even at 5 hertz. Even at 5 hertz on this it feels way more powerful than a 10mm amplitude model like the Zaaz 20k or even the Pulser 2 that has 11mm amplitude. The Nitrofit deluxe plus has 13 mm just like this one but goes to 22 hertz. The Gravity Revolution goes to 30 hertz. That 8 extra hertz makes the difference between a machine that costs 2000 and this one that costs 3500. For 1500 dollars many people are like what am I getting that is different. People have bought the Nitrofit that Costco sells for 2100 or seen the Zaaz 20k that costs 2200. This one is about 1000 dollars more than the Zaaz 20k after taxes. So for 1000 dollars more it has 30 hertz instead of just over 15 hertz on the Zaaz 20K. But the Zaaz has 10mm amplitude and smooth for people that have bad backs and usually those with lots of pain in their knees. The Zaaz is FDA approved and has lots of G force on the low levels. (Go to any Costco or Sam's club and see if they have them on display there. The Gravity Revolution can hold 440 pounds while the Zaaz holds less. For those that want to engage the fast twitch muscles this machine does it better and faster than any machine I have used. You kind of float on the plate and still get the G force. It is not really jarring since I am floating on it at this speed. Similar in feel to the Vibeplate in a way. I am sick of every company saying they have the best one that I had to build this site. I will not sell machines that I do not approve of. I will give honest advice and reasons for my recommendations based on my research. 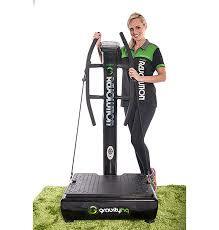 If you are interested in a Gravity Revolution Vibration machine call me at 1-866-945-9072. Ask for Jake. coupon is good only on machines we stock. I will contact you with our lowest price today. Get a coupon code for the machine for any machine we sell below.